It is strongly recommended that the gold standard for the diagnosis of TMD according to the DC/TMD and the differential diagnosis of orofacial pain conditions should be based primarily on information obtained from a comprehensive history together with a clinical examination and, when indicated, TMJ imaging (Schiffman and Ohrbac, JADA 147(6):438–445, 2016). 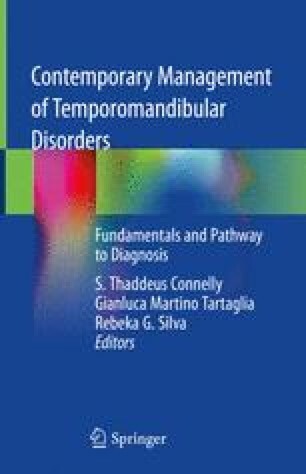 Indeed for the TMJ disorders, the reference standard was established by board-certified radiologists using bilateral TMJ magnetic resonance imaging (MRI) and computed tomography (CT). Together with the physical diagnosis (Axis I), questionnaires for the evaluation of psychosocial factors were identified to assess a reliable and valid Axis II profile [Ohrbach, J Oral Rehabil 37:784–798, 2010). When the clinician uses the Axis I, diagnoses must first exclude odontogenic disease and other pain disorders that can occur in the masticatory system.